“Hooked” is based on Eyal’s years of research, consulting, and practical experience. He wrote the book he wished had been available to him as a start-up founder – not abstract theory, but a how-to guide for building better products. 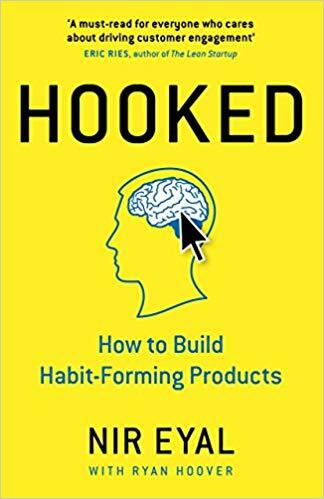 “Hooked” is written for product managers, designers, marketers, start-up founders, and anyone who seeks to understand how products influence our behaviour. Eyal provides readers with practical insights to create user habits that stick; actionable steps for building products people love; and riveting examples from the iPhone to Twitter, Pinterest and the Bible App. Nir Eyal spent years in the video gaming and advertising industries where he learned, applied, and at times rejected, techniques described in “Hooked” to motivate and influence users. He has taught courses on applied consumer psychology at the Stanford Graduate School of Business and the Hasso Plattner Institute of Design and is a frequent speaker at industry conferences and at Fortune 500 companies. His writing on technology, psychology, and business appears in the Harvard Business Review, The Atlantic, TechCrunch, and Psychology Today. Ryan Hoover‘s writing has appeared in TechCrunch, The Next Web, Forbes, and Fast Company. After working on “Hooked” with Nir Eyal, Hoover founded Product Hunt, a company that has been described as “the place to discover the next big things in tech”.